This is a series of articles on my adventures on a low MMR account. My main account is at 4200 rating from playing mostly support. This is an experiment to see what the experience is like climbing the ladder while supporting from a low MMR account (2200). Here's the rules I am playing by - Declare I'm supporting at the start, control map with wards throughout the game, buy the courier, don't take farm from any other heroes, obtain detection as necessary, item focus will be healing and defensive in nature. I do not play a solo lane of any kind. I score 5 straight wins, bringing me from 2386 to 2509. Overall there was only 1 game with an abandon. Warding: The enemy team did not buy a single observer ward. Summary: The Necrophos plays very passively and is very poor at last hitting, so we don't accomplish very much in lane at all. 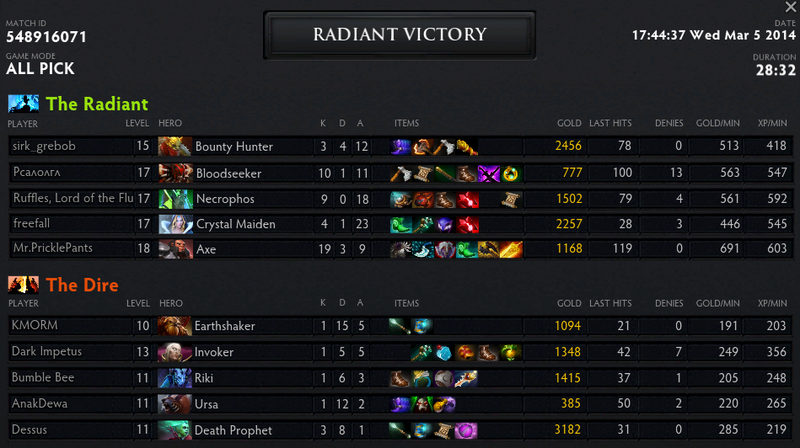 Our Axe and BH offlane creep cut against an Ursa and Earthshaker, who are helpless to prevent it. 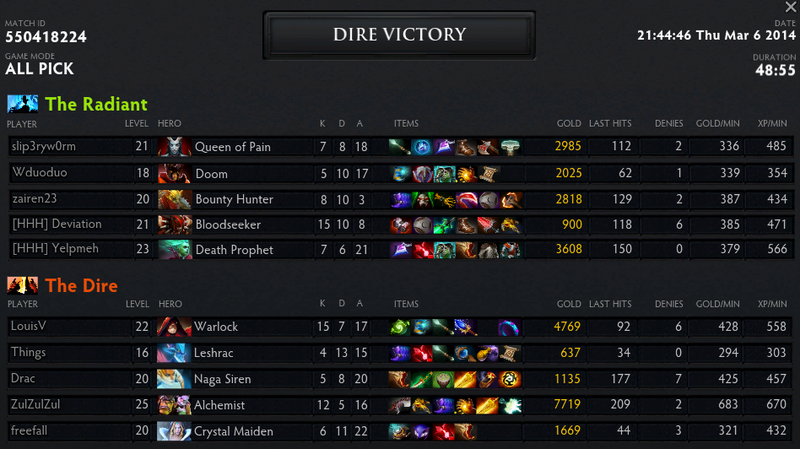 They score first blood on top and an early tower, propelling our Axe to an unstoppable midgame. Warding: The enemy Death Prophet kept the map warded, with even some sentries to catch out BH and Kunkka out. This is the second game with enemy wards. 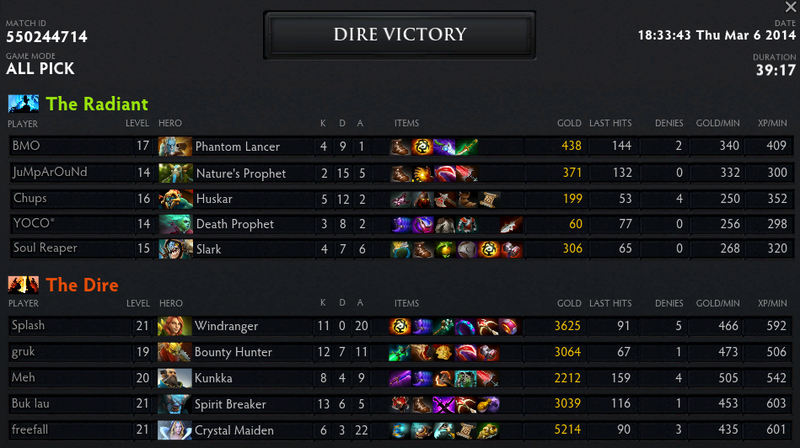 Summary: The enemy sent the Death Prophet to solo offlane against us. Her item choices were extremely perplexing - she bought a Blades of Attack and nothing else to start with. She gets harassed out at level 2, walks home, heals up and... still doesn't buy any regen consumables, and instead buys a set of wards. She comes back to the lane and is instantly killed. She respawns, and comes back to the lane, and dies again pretty much instantly. Windrunner and I are both level 6 at this point and we take the tower and then go help the rest of the map, while Death Prophet is still level 3 with no items. The enemy has a split push lineup (NP, DP and PL) and at low MMR levels I suspect most players have no clue how to deal with it and wasted a lot of time running from lane to lane trying to defend against the split push only to have the enemy withdraw before they got there. Summary: There's a particular trend where at low MMR people are allergic to picking heroes with disables. I get a typical ally Death Prophet who isn't able to contribute anything in the laning phase. Things start out very badly. Our mid lane feeds first blood, and our top lane counterpicked themselves by getting two melee heroes against a Dark Seer who maxes ion shell first. Unsurprisingly they're unable to get any farm and end up feeding the Dark Seer a double kill. I decide to rotate while refreshing the wards and score a few kills mid and top, but it takes until well into the midgame until we manage to stabilize the GPM and XPM deficit and start to pull ahead. I've decided to buy a Bloodstone from now on because I might as well try to blend in. 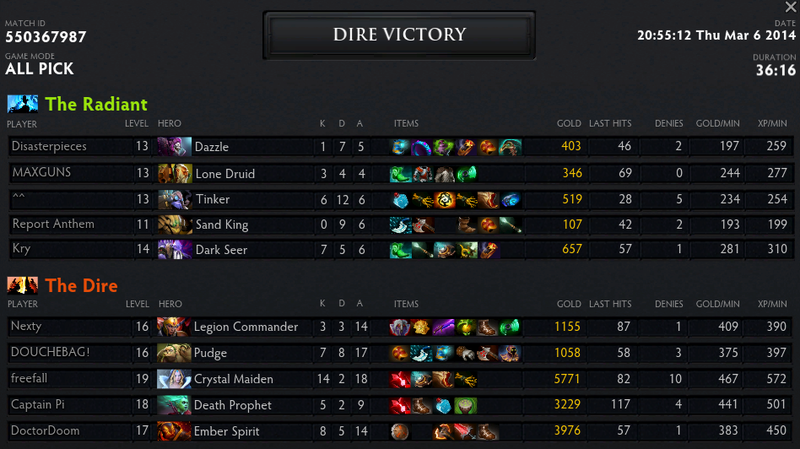 I won the ninth game as Crystal Maiden (duo offlane with Naga Siren) at 2460 rating. Summary: The enemy picks a very gank heavy lineup (Doom / QOP / Bloodseeker / Bounty Hunter) while our carry Alchemist starts the game by maxing his passive. Naturally we get crushed in the mid game, with multiple team wipes for our team. But eventually the Alchemist farms himself to victory. This is also the first game I have seen with a BKB. 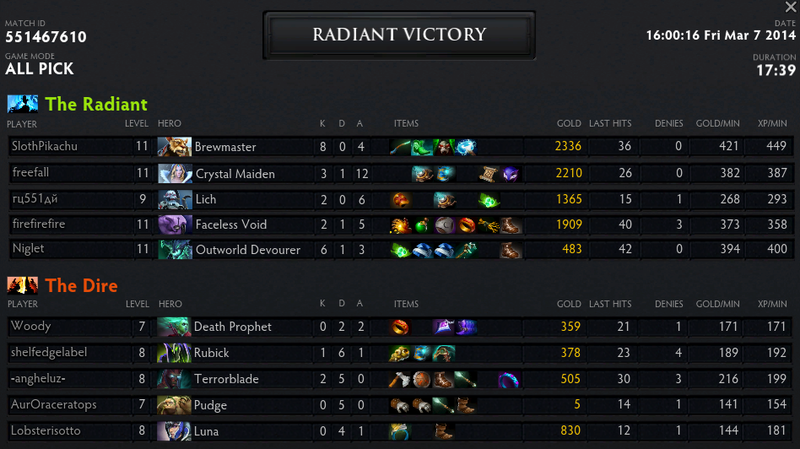 I won the tenth game as Crystal Maiden (duo offlane with Brewmaster) at 2485 rating. Summary: Finally a lane partner that can do something in the early game! Brewmaster is a deadly hero at low levels, due to his above average stats and powerful thunderclap. I grab the starting haste rune and immediately score first blood with it. We manage to score 8 kills on top lane in the first 9 minutes to set us up with an unstoppable advantage. At this point the demoralized enemy team starts disconnecting.